RdellaTraining.com | Do You Make These 7 Kettlebell Swing Mistakes? There’s a few common kettlebell swing mistakes that can prevent you from getting the results you want. These aren’t mistakes made by the newbie, either. Take a read through to make sure you’re not making any of these easily avoidable swing errors. Here’s 7 of the most common things I’ve seen with the Russian-style kettlebell swing. By far, this is one of the biggest mistakes people make. The ketttlebell swing is done with explosive hip drive. As the bell is propelled forward horizontally, the kettlebell is raised approximately to shoulder level. The “explosiveness” of the hips is what projects the kettlebell, not the activation of the shoulder muscles (frontal deltoids). We MUST explode with hips for the swing to be effective and efficient. Always think about the explosiveness in your hips to maximize the swing properly. It’s all about the hips folks. The swing is a hinge, not a squat. The sooner we understand this, the better our swing, the better our results. The hip hinge is a REALLY important concept to understand. If you don’t hinge properly, it’s not a swing. This a BIG one! If you’re not breathing properly you lose power with the exercise. The swing is about power production, which you get from proper breathing. The best way to increase power is with a biomechanical breathing match. What does this mean? This means that you exhale with force production. In the case of the kettlebell swing, you exhale forcefully as the bell projects forward and you inhale as the kettlebell comes back between your legs. And, don’t be afraid to let out a powerful “hiss” as you exhale forcefully. The “hiss” lets air out slowly right up until the the moment of maximum force (at the top of the kettlebell swing). This is a very effective breathing technique. The kettlebell swing is a ballistic. That means we move fast and explosive. Again, fast and explosive. A huge mistake many people make is moving too slowly through the exercise. Again, it goes back to explosive hip drive you have with a proper kettlebell swing. We must move efficiently through the exercise, learn how to use our hips, and learn how to leverage the relationship between tension and relaxation. It’s an explosive movement, not a slow movement. Remember the word “ballistic” when thinking about a swing. Keep a firm, comfortable grip on the bell, but don’t give it the “death grip” during the swing. Save that for the press. I needed to include this here because it’s so important. There’s no place for soft, cushiony running shoes with kettlebell ballistics. Why is this so important? Stability. Train with firm, flat soled shoes (Chuck Taylor’s or a minimalist shoe) or train in bare feet. You need to be stable and grounded with kettlebell swings (and other ballistics). This is a rule not to be broken and is essential if you’re serious about training with kettlebells. It’s that important. At the top of the swing, when the kettlebell floats up to shoulder level, the glutes must be contracted. Remember the 1st point, explosive hip drive, right? Well, to finish the hip drive, we have to contract our glutes. There’s a great cue to remember to finish with your hips. The cue is “pinch a coin.” I think you probably know what that means. We must be aware of glute contraction as we finish the swing. In addition to the hip power we have when doing this, we stabilize our pelvis and protect the back. Finish the swing with tight glutes at the top. It makes a huge difference. There’s even more to it than this, but these are some of the most common errors that are easily fixable. Swing the bell and swing it well. I’ll close with that. Please share this on Facebook, Twitter, or anywhere you’d like to help people power their kettlebell swing! 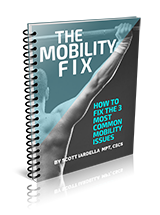 Scott Iardella, MPT, CSCS writes about training methods to optimize health and performance. 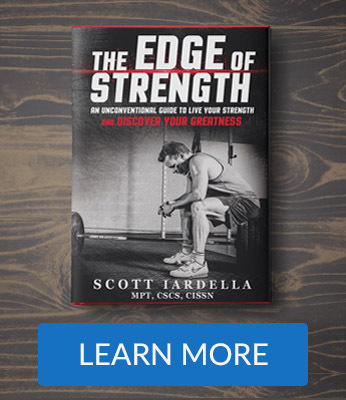 If you enjoyed this article, join a strong and growing community of passionate fitness enthusiasts and subscribe below to get a ton of cool, free stuff! Subscribe below or go to RdellaTraining.com/join.